Here's something fun for the month of September. 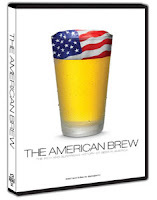 I have a copy of "The American Brew" DVD to give away to one reader this month. This documentary delves into the history of beer in America. It contains appearances by Fritz Maytag, Garrett Oliver, Charlie Papazian, and Carol Stoudt among others. From the Founding Fathers to Prohibition to the modern craft beer movement, the show illustrates the rich, and evolving, tradition of brewing in America. For the month of September, simply contribute a comment to any post on this blog and you will be entered into a drawing for the DVD. I'll select one name at random at the end of the month. Each accepted and published comment will be counted as an entry in the drawing. It's that simple. Enjoy, and good luck! Does this count? I've always wondered about that DVD but never pursued it. Excellent opportunity, thanks! A comment? Like this? How about that? Even I can avoid failing at this. every red blooded american should know the history of beer. and please stop drinking lite beer. Sounds very interesting and would love to see it. Thank you! Interesting DVD, I love to learn new things. What a great dvd! Thanks for the contest and congrats to the winner!! This would be so great for a gift this Christmas because several of our friends are home brewers. Hope this comment counts! My brother in law would adore this video! Great gift! My son-in-law would love this DVD!